On today’s show we are going to look at some common ectoparasites–lice. According to the CDC, lice are parasitic insects that can be found on people’s heads, and bodies, including the pubic area. 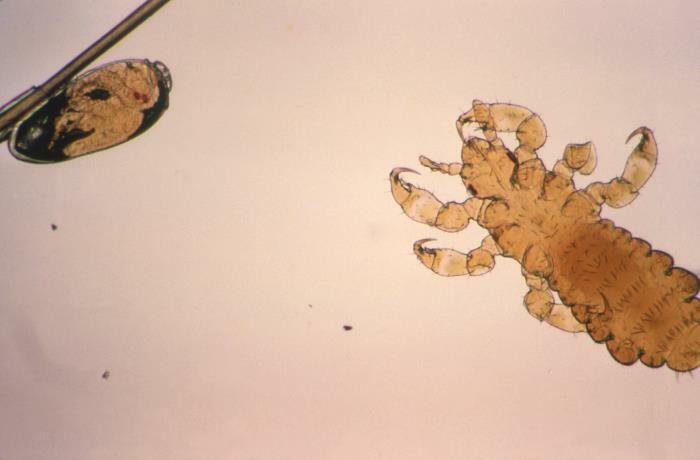 Human lice survive by feeding on human blood. Lice found on each area of the body are different from each other. The three types of lice that live on humans are head, body and pubic louse. Head and body lice will be today’s topic and parasitology expert and author of Parasites, Tales of Humanity’s Most Unwelcome Guests, Rosemary Drisdelle is here discuss it with me. Walk-In Lab is offering discounted Vitamin B12 and Folate Blood Test Panels as low as $54 with NO DRAW FEE! This photomicrograph depicts on the left, an unhatched egg of a head louse, Pediculus humanus var. capitis, still attached to a human hair shaft, and on the right an immature organism, otherwise referred to as a nymph. You are able to see the red-colored eyespots of the louse embryo developing inside the egg. This is a great discussion on Head & Body Lice. Thank you for sharing your expertise as most people aren’t aware of the nuances and difference between these parasites. The only thing I would add is that there is actually a non-insecticidal treatment option for head lice, which wasn’t mentioned in the show. About 10 years ago, the FDA cleared a Class-A medical device that heats and dehydrates both the lice and their eggs, killing both. The device is called the AirAllé and its patent is owned by Larada Sciences DBA Lice Clinics of America (www.liceclinicsofamerica.com). I just wanted your listeners to be aware that there is an alternative head lice treatment option beyond putting harmful pesticides on your head.